I love the length of this apron. Hard to spill stuff on your self when this apron is tea-length. This is also a thrift apron for $2.00 looks to be handmade but not sure could be store bought. Has two ties around the waist and three pockets on the front. 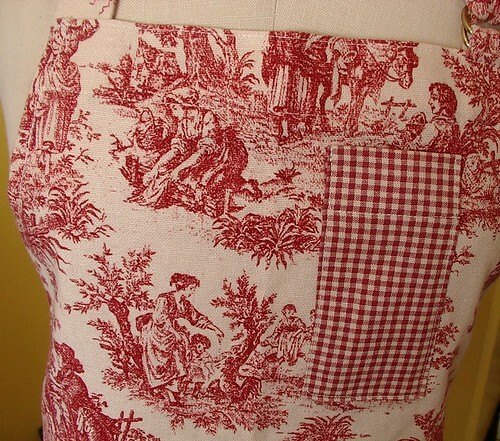 This is a thick linen apron. Not sure what someone would put on the small pocket other than a pen or pencil. 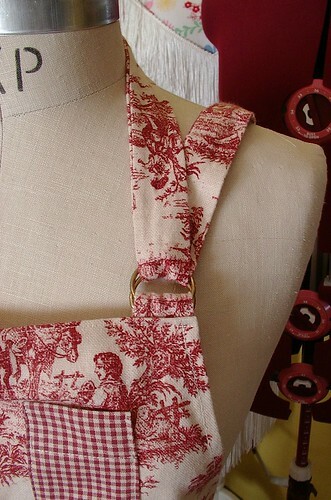 I like the belt buckle like closure for the shoulder strap makes it supper simple to adjust. LOVE IT! You lucky duck! Beautiful apron and for only $2, that's a real steal! Lucky you! It's handmade. I recognize the print as one that we sold not too long ago at Joann Fabrics. It's in the Waverly home decor section, and it was called the "Rustic Life" print. It's a heavy cotton/linen blend.